The 2017 Honda Fit is functional and fun, all wrapped up in a small, yet roomy package. This sub-compact hatchback offers an unsurpassed cargo area for a vehicle of this size. Excellent fuel efficiency and cutting-edge technology round out the many attributes of this feisty little vehicle. Whether just tooling around town, or hitting the open road, this lively sub-compact hatchback makes getting there a joy. The stylish and modern exterior will draw you in, while the comfortable and well-appointed interior will close the deal. The 2017 Honda Fit is the perfect blend of function and fabulous! You may wonder where you can test drive a 2017 Honda Fit near San Bernardino, CA, or anywhere in the Inland Empire. The simple answer is: right here at Rock Honda, near Rancho Cucamonga, CA. We pride ourselves on being a full-service dealership that offers financing, as well as a state-of-the-art repair and service department. We believe happy customers are repeat customers. That is why we focus on 100% customer satisfaction and keeping our lot stocked with 2017 Honda Fit inventory near San Bernardino, CA. When you come in search of your new 2017 Honda Fit for sale in Fontana, CA, be sure to inquire about our many special offers. You will be amazed at the number of standard features packed into the 2017 Honda Fit in Fontana, CA. For starters, there is a center console with an armrest featuring an all-important storage compartment and beverage holders. A cargo area light is also standard equipment to make sure nothing gets left behind after a trip to the grocery store. 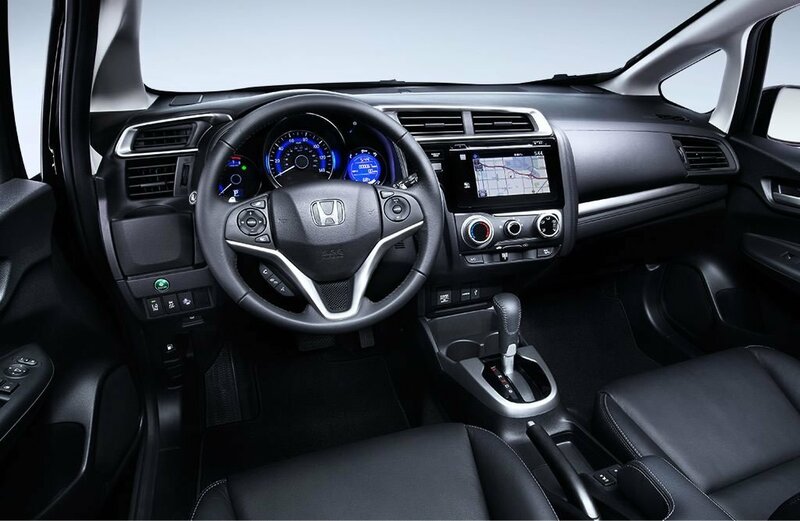 As always, technology is important in all Honda products, and that is why the Bluetooth® HandsFreeLink® and a 5-inch LCD screen are both standard in every Fit. You may, of course, opt for the available, massive 7-inch display with a high-resolution electrostatic touch screen, available on some models. We look forward to helping you build the perfect 2017 Honda Fit to meet all of your needs. Every 2017 Honda Fit is powered by a 1.5-liter 4-cylinder engine, which generates an impressive 130 horsepower and up to 114 lb.-ft. of torque. The standard direct injection engine features allow for remarkable fuel efficiency. This perky engine is matched with a manual 6-speed transmission. The continuously variable automatic transmission (CVT) is available on some models, as well. Lack of power or performance shouldn’t be a problem when behind the wheel of the versatile 2017 Honda Fit, which can be found at Rock Honda in Fontana, CA. Our friendly team will be happy to show you how you can equip this vehicle to your specifications!